Conservative talk-show host Rush Limbaugh took a potshot at NASCAR Nation during an appearance on Fox News’ On the Record with Greta Van Susteren Tuesday night. NASCAR spokesman Ramsey Poston reponded to Limbaugh’s remarks, saying, “Obviously, Mr. Limbaugh hasn't spent much time with our drivers or fans. NASCAR drivers and fans represent the best of America, whether they are from small towns or big cities." 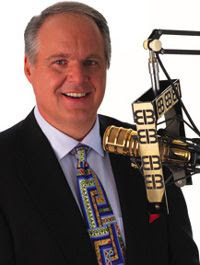 UPDATE: Rush Limbaugh went to great lengths Thursday to stress that he does not associate NASCAR with “hayseed hicks.” On his national radio show today, Limbaugh clarified his thoughts, saying, “I don’t look at anybody as a NASCAR hick. I was simply trying to portray (that) this is the way the Democrats and the media look at Sarah Palin, and the way they look at NASCAR. Democrats look at NASCAR the way they look at pro-lifers: with contempt and condescension. And that’s all I was trying to relay. 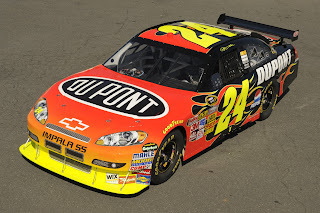 I have got nothing against NASCAR whatsoever." 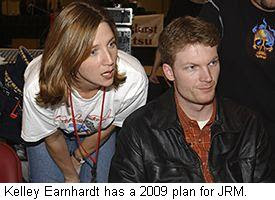 Kelley Earnhardt commented Wednesday on reports of recent layoffs at JR Motorsports, and the possibility that the team may not field its #5 Nationwide Chevrolet next season. The United States Navy has already announced that it will not return as sponsor of Brad Keselowski’s JR Motorsports #88 team next season, and Earnhardt, the General Manager of JR Motorsports said, "We've been working aggressively to secure funding to continue with two teams in the NASCAR Nationwide Series. The economic climate is difficult, as everyone is aware, and that is affecting every company's ability to spend. The 2008 season will be ending in less than three weeks, and preparations for next season are already underway. We do not anticipate getting the funding required to field two teams after the end of this season, and we need to make adjustments now to prepare JR Motorsports accordingly. We are reducing our workforce and budgets to comply with a new plan for 2009, which at the present time is to field the #88 team full-time with driver Brad Keselowski, and the #5 team on a limited basis with a select group of drivers." Morgan-McClure Motorsports General Manager Larry McClure has been indicted by a federal grand jury on charges of wire fraud, mail fraud and violating federal tax law. The U.S. Attorney’s office said yesterday that McClure faces a maximum penalty of 115 years in federal prison, and up to $2.75 million in fines if convicted on three counts of mail fraud, three counts of filing a false tax return, two counts of obstructing a tax investigation, two counts of money laundering and one count of wire fraud. The indictment accuses him of filing fraudulent income tax returns in 2002, 2003 and 2004, failing to declare several large payments from an unidentified Florida man who leased race cars from him to run in ARCA competition. 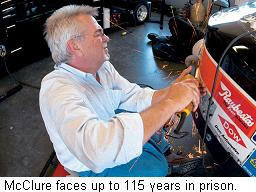 McClure is also accused of fraudulently claiming he spent nearly $60,000 to have four new show car trailers painted in early 2003, and of falsely telling IRS investigators in June of 2006 that he had borrowed money from that same Florida man, then repaying the loan with a $325,000 check. Morgan-McClure Motorsports won a total of 14 Sprint Cup races, including three Daytona 500s before ceasing operation in January of this year due to a lack of sponsorship. `Q' Gears Up For The Big Day! Here's Suzy and her mummy, co-stars of the annual Armstrong Family Haunted Garage! Click HERE to make a contribution to the American Cancer Society on behalf of Team MRN and the Haunted Garage. 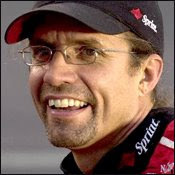 Kyle Petty said today that he will run the Rolex 24 at Daytona, and is considering the full 2009 Grand American Rolex Series schedule with Orbit Racing. Orbit will field a BMW Riley with Petty, Leo Hindery and Darren Manning in the Rolex 24, and Kyle said sports cars may provide the next chapter in his racing career. 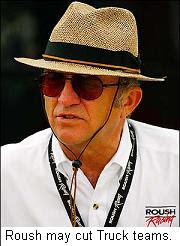 Petty is no stranger to sports cars, having made six previous starts in the Rolex 24; three of them with Orbit Racing. He has three top-15 finishes overall, including a sixth-place finish in 2003 and a seventh in 2001. His future with his family business – Petty Enterprises – is uncertain at best, with CEO David Zucker saying last week that the team will field two full-time entries next season, neither of them driven by Petty. Zucker did hold out the possibility of a part-time schedule for Petty, but only if sponsorship can be found. The Godfather's whip is for sale! 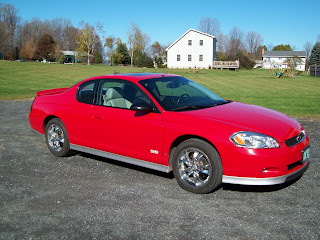 This is Dave Moody's personal 2006 Chevrolet Monte Carlo SS, rally red with ALL the candy. 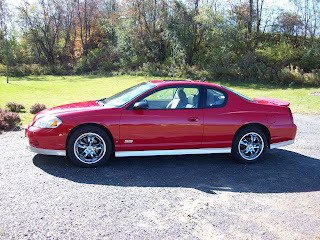 The car has less than 11,000 original miles (summer driving only), and is in excellent condition. She's a looker and a performer, with enough power to get you in trouble if you're not careful. 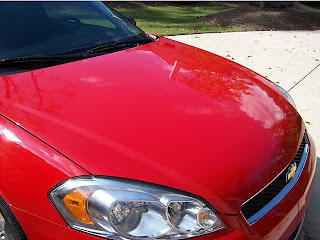 Perfect paint, flawless light gray leather interior and all the extras that make this car a true attention-getter. PRICE: $27,000 firm, no trades. TERMS: Cash or certified check seven days before delivery. 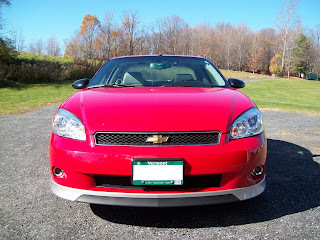 Buyer is responsible for vehicle pickup or shipping. 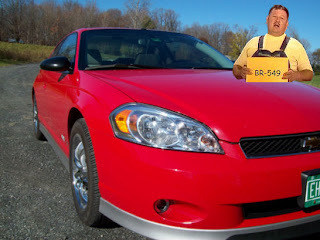 Car is sold as is, with no warranty real or implied. For further information, e-mail speedway@sirius-radio.com. FIRST COME, FIRST SERVED! Jimmie Johnson is three races away from doing what only one other driver has done in the history of NASCAR; win three consecutive Cup Series championships. The success enjoyed by Johnson and his Hendrick Motorsports/Lowes Home Improvement team should be the toast of NASCAR Nation, but instead, the sport is besieged by calls for a revamped points system designed to halt the team’s dominance. Only in NASCAR does excellence breed this kind of contempt. Baseball’s New York Yankees have won the World Series 26 times, including a run of eight championships in 12 years between 1947 and 1958. Even at the height of Yankee dominance, nobody suggested changing the rules of baseball to allow other teams to compete. Beginning in 1965, the Montreal Canadiens won the Stanley Cup nine times in 14 seasons. Nobody advocated changing the National Hockey League Playoffs. From 1982 to 1997 the NFC won the Super Bowl 15 times in 16 years. Despite this lopsided margin, nobody seemed interested in overhauling the NFL playoff system. UCLA once won 10 NCAA men’s basketball championships in 12 years. Nobody tried to outlaw coach John Wooden, or change the format of the NCAA tournament. The Chicago Bulls won six NBA titles between 1990 and 1998. There were no calls to ban Michael Jordan from the hardwood, or change the playoff system. Pete Sampras won 7 Wimbledon titles between 1993 and 2000. Nobody changed the rules of the tennis, or the format of the legendary tournament. Muhammad Ali won 56 times in 61 professional fights. Not one writer suggested that “The Greatest” fight with one hand tied behind his back. And yet, our sport seems determined to continually revamp its rules in an effort to prevent any one team from succeeding for any length of time. In 2003, Matt Kenseth won the Sprint Cup championship while winning only one race. NASCAR fans – and many members of the media -- clamored for a new system that put more emphasis on winning races, and less on Kensethian consistency. The next season, they got their wish. Now, just five years later, Jimmie Johnson is on track for his third consecutive Sprint Cup title, winning 21 races (to date) in that three-year span. Instead of saluting that amazing run of excellence, NASCAR fans -- and many of those same media members -- are clamoring for yet another revision to the championship system; one that puts less emphasis on winning, and once again rewards consistency. When Cale Yarborough authored his three-peat in 1976-77-78, he won 28 times and posted 56 Top-5 finishes in 90 starts. In the last three seasons, Johnson has won 21 races and posted 47 Top-5 finished in 108 starts; less formidable numbers than those posted by Yarborough. If Cale’s dominance did not warrant a major overhaul of the sport, why does Johnson’s? The simple answer is that it doesn’t. NASCAR has announced penalties, suspensions and fines to the No. 83 Red Bull Racing NASCAR Sprint Cup Series team, as a result of rules infractions found yesterday during a post-race technical inspection at the NASCAR Research and Development Center in Concord, N.C. 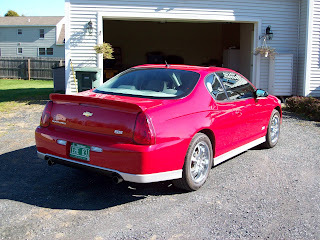 The car was found with exterior sheet metal body parts that did not meet the minimum thickness specified in the 2008 NASCAR rulebook. As a result, crewchief Kevin Hamlin and carchief Craig Smokstad, have been suspended indefinitely from NASCAR. Hamlin has been fined $100,000. Driver Brian Vickers and owner Dietrich Mateschitz have been docked 150 driver and 150 owner points, respectively. Vickers’ car was selected at random for inspection following Sunday’s TUMS Quik Pack 500 at Martinsville Speedway, and officials found doors, fenders and quarterpanels that were thinner than the 24-gauge steel mandated by NASCAR. That is in violation of NASCAR’s strict rules governing body specifications for the new Car Of Tomorrow, in addition to raising safety concerns. Red Bull Vice President and General Manager Jay Frye said of the ruling, "As a team, we accept full responsibility for the infractions…and will not appeal NASCAR's ruling. This approach to racing is against the values of the Red Bull Racing Team, and the necessary steps will be taken to rectify the situation, ensuring it does not happen again. It is a privilege to race in the NASCAR Sprint Cup Series and we are taking this penalty seriously.” Frye said that R&D Manager Randy Cox will serve as interim Crew Chief for Vickers at Atlanta Motor Speedway this weekend. Trick Or Treat! It's Dinger! 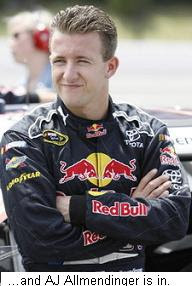 Never one to wait for the last minute, AJ Allmendinger already has his Halloween costume picked out! It's FLAMER BOY!!!!!! NASCAR Craftsman Truck Series driver Rick Crawford told Sirius NASCAR Radio's Sirius Speedway Monday that the Circle Bar Racing Team will remain with Ford Motor Company next season, despite Ford's decision to cut its support to the series. "I met with the people from Ford prior to Talladega, and they laid it all on the table," he said. "People are having a tough time in this country right now, and they're not buying vehicles the way they have in the past. 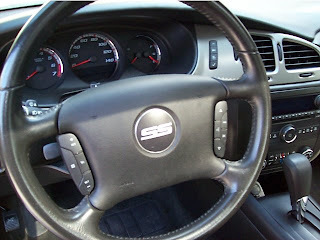 The economy's in a crunch right now, and Ford has to tighten its belt a little, but we will make it through. 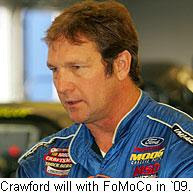 "Circle Bar Racing will be a Ford factory team again in 2009," said Crawford. "Our budget from Ford will be cut, but we're opening our doors to an associate sponsor to help keep us competitive. I hated to get the news (from Ford), but it's real." After 17 years with team owner Tom Mitchell and Ford, Crawford said there is no doubt in his mind that both the #14 and #10 trucks will be Ford-powered again next season, though there will be differences in the way business is done with the manufacturer. "Engine support will continue to be offered, but now we'll have to pay for it," he said. "This is aa temporary situation. Things will get better (economically). They always do." 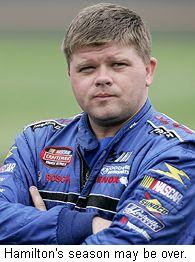 Bobby Hamilton, Jr., told Sirius Speedway Monday that this weekend's race at Memphis will be the final race of the season for Team Rensi Racing, due to lack of sponsorship. Hamilton currently stands 15th in Nationwide Series points, despite missing two races due to lack of sponsorship. "The deal is done after Memphis, and unless they can find (sponsorship), we're through," said Hamilton. "The Rensis are racers, but if the money's not there, it's just not there." Ford Racing has extended its commitment to NASCAR Sprint Cup Racing for the next five years, signing an extension of its current contract with Roush-Fenway Racing. Jack Roush confirmed that deal this weekend, saying, "Ford has made us a commitment for five years going forward…that we feel is adequate to our needs." Roush currently fields five of Ford’s eight Sprint Cup Series teams, and has a close alliance with Yates Racing, which fields two others. However, Roush also revealed that Ford will join Dodge in withdrawing its monetary support for the NASCAR Craftsman Truck Series next season, in response to a downturn in sales and a sluggish economy. Director of Ford Racing Technology Brian Wolfe said the Detroit automaker will continue to provide some technical and engineering support to Truck Series teams, adding, "We remain positive about the performance of our teams and their dedication to the company during these challenging times." Sources close to Roush Fenway Racing say the decision could result in the closure of at least two of the team’s three Truck Series teams. Roush currently fields Erik Darnell’s Northern Tool and Equipment #99, the #6 ConWay Freight Ford driven by rookie Colin Braun, and the #09 Zaxby’s Ford driven last weekend at Martinsville Speedway by Jamie McMurray. Ford also supports three other Truck Series entries for Circle Bar Racing (Rick Crawford and Brendan Gaughan) and the Wood Brothers (Jon Wood). In other manufacturer news, Gillett Evernham Motorsports is now almost certain to jump from Dodge to Toyota next season. Sirius Speedway first reported on that possibility more than a month ago, and there have been other published reports to that effect in recent weeks. But based on conversations in the NASCAR garage this weekend with sources close to both GEM and Dodge, it appears that a deal is imminent within the next few weeks, or even days. Sirius Speedway has learned that the deal will hinge upon Gillett Evernham’s purchase of the Bill Davis Racing Sprint Cup Series team -- complete with its Toyota factory relationship – and would put Kasey Kahne, Elliott Sadler and Reed Sorenson in Toyotas next season. 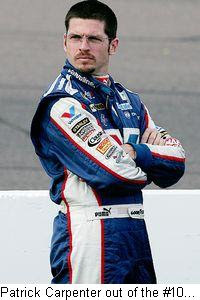 Gillett Evernham has arguably been argueably most successful team of 2009, with Kahne winning a pair of point-counting events and the NASCAR Sprint All Star Race. GEM also plays a major role in Dodge’s engine development program. Bill Davis Racing’s highly successful NASCAR Craftsman Truck Series teams will reportedly not be a part of the sale. NHRA PowerAde Drag Racing Series Funny Car driver Ron Capps will drive a NAPA-sponsored NASCAR Late Model in the companion event to the NASCAR Camping World Series championship finale in Roseville, Calif., on October 25. Capps' and his NAPA Dodge Charger R/T Funny Car rank seventh in the NHRA championship chase with two races remaining, and he will make his asphalt Late Model debut in a car owned by NASCAR Camping World Series West team owner Bill McAnally. Capps has previously raced Late Models, Sprint cars, Midgets and open-wheeled sports cars in his career, and made Sirius Speedway history by ignoring the Godfather's advice and flipping his car sky-high in the Chili Bowl Midget Nationals a few years ago, breaking a bone in his shoulder. 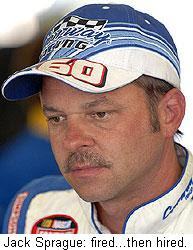 Capps displayed the long-term memory loss caused by that wreck, saying, "Getting a call from Bil McAnally was awesome. I've always watched the team from afar...and the chance to go up there and drive is incredible. I just want to represent my sponsors well and not do anything stupid on the track." Capps will also serve as Grand Marshall for the event. 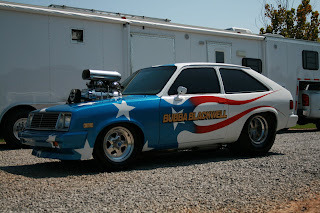 Legendary motorcycle stuntman and Sirius Speedway fave Bubba Blackwell sends along this pic of his blown Chevy Chevette. That oughta get the groceries home! The NASCAR Nationwide Series’ new Car Of Tomorrow is testing this week at Lowe's Motor Speedway, and the reviews are once again overwhelmingly positive. The car was shaken down in two sessions Monday, and is back on track again today with seven teams taking part. Chip Ganassi Racing, JD Motorsports, Joe Gibbs Racing, Richard Childress Racing, Michael Waltrip Racing and two teams from Roush Fenway Racing are putting the new design through its competitive paces, and the car apprears to be a big ht so far. “It seems like it has a little more front downforce,which makes it turn real well," said Carl Edwards at the end of Monday's afternoon sesion. "It's nice to have a car that turns like that." JGR driver Joey Logano said, “The body styles are kinda cool on them. I think they're different, and (they) look a lot like the street car, which is pretty neat." NASCAR Vice President of Competition Robin Pemberton said he also likes the look of the new car, while stressing that the manufacturers have still not submitted their final body specifications. Pemberton revealed for the first time yesterday that the new car will not make its competitive debut until the 2010 season. NASCAR had originally planned to introduce the car as soon as next August, but revised their timeline after teams balked at the cost of switching their entire inventories on such short notice. Pemberton also said there will be no rule changes to the Sprint Cup Series cars next season. HERE SHE IS: SUZY AS MISS WINSTON!! 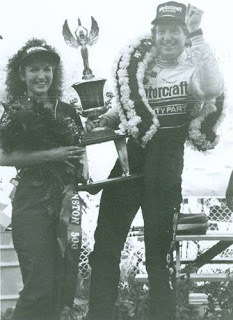 Here's the lovely Suzy Q as Miss Winston, with Bill Elliot after Awesome Bill won the 1987 Washington 500 at Evergreen Speedway in Monroe, Washington. The late-season driver shuffling is underway, as teams begin to set the stage for 2009. Three NASCAR Sprint Cup Series teams will make driver changes this weekend at Lowe's Motor Speedway, just a week after Red Bull Raciing released AJ Allmendinger in favor of a split schedule featuring veteran Mike Skinner and newcomer Scott Speed. Mike Wallace will drive the Gillett Evernham Motorsports No. 10 Dodge at Lowes, just days after a confrontation between former driver Patrick Carpentier and Team Director Mike Shiplett at Talladega. Shiplett reportedly confronted the Canadian driver after the team failed to qualify, accusing him of running too low on the final straightaway, causing the car's front splitter to bottom-out, scrubbing off valuable speed. Carpentier called that accusation, "bulls__t," and "a complete lack of respect," pointing out that the driver has little to do with the car's performance in a single-car run at Talladega. Shiplett was unavailable for comment, but reportedly apologized to Carpentier early this week. A.J. Allmendinger will assume the driving duties of the #10 Dodge at Martinsville in two weeks, and for the remainder of the season. Allmendinger could theoretically help Gillett-Evernham bump his former team -- Red Bull Racing -- out of the Top-35 in owners' points. The #84 Red Bull Toyota is currently 34th in points, with GEM's #10 Dodge 39th. Reed Sorenson has signed to drive the #10 for GEM next season. Bryan Clauson will make his NASCAR Sprint Cup Series debut at Lowe’s Saturday night, driving Chip Ganassi Racing’s #40 Dodge, with sponsorship from the new computer game MotorStorm Pacific Rift. The 19-year-old Clauson has been driving Ganassi’s #40 Fastenal Dodge on the NASCAR Nationwide Series this season, with one pole, one top-five and two Top-10 finishes. He will have to qualify on speed, since the #40 team is outside the Top-35 in owners points, after suspending operations earlier this season. Bill Elliott will be back behind the wheel of the Wood Brothers Racing U.S. Air Force Ford this weekend, and for the remainder of the season. Marco Ambrose was scheduled to drive the #21 Ford at Texas and Phoenix, but recently announced plans to race for JTG-Daugherty Racing full-time next season, in partnership with Michael Waltrip Racing. The late-season driver swaps are not confined to the Sprint Cup ranks, either. Three-time NASCAR Craftsman Truck Series champion Jack Sprague will pilot the No. 60 Wyler Racing Toyota Tundra for the remainder of the season, after being released by Kevin Harvick, Inc earlier this week. Sprague, who currently sits eighth in the NASCAR Craftsman Truck Series championship standings, replaces Terry Cook, who was released by the team despite ranking 10th in points. Sprague and Wyler Racing ran 55 races together from late 2005 through the end of last season. They visited Victory Lane three times – including the 2007 season opener at Daytona – with four poles, 18 top-five and 27 top-ten finishes. Their reunion is only for the final races of this season, but efforts are underway to secure sponsorship for 2009. Cook is reportedly working on a deal to finiish out the season with another team, and he will join us later today (Wednesday) on Sirius Speedway. There really WAS a Stan Brock, and he really DID wrestle a boa constrictor on Mutual of Omaha's Wild Kingdom! Jeff Gordon, Hendrick Motorsports and DuPont unveiled Gordon's 2009 ride today, complete with a nasty, black-based paint scheme.